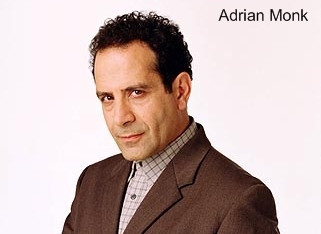 On the TV show Monk, the lead character Adrian Monk is a private detective with more phobias and odd quirks than most people could ever imagine. He’s actually pretty dysfunctional as a person, his pretty assistant or shall we say full-time baby sitter Natalie, helps him through his fits and quirks. However Adrian Monk has one great talent – he can solve any murder case no matter how complicated or how little clues are available. He’s an unsung hero, a behind-the-scenes kind of guy who always gets the job done with perfection. He never gets credit for his unsurpassed crime solving abilities. Instead the local police captain named Stottlemeyer, the guy Adrian Monk always solves cases for, garners all the attention. Back in the 1980s, in the Ford camp the Mustang got all the glory. The Mustang was like Captain Stottlemeyer, a "Marlboro Man" type of guy with a big moustache, who looks like the typical hero from an outdated cowboy movie. However what most people don’t remember was there was a Mercury brother to the Mustang, built on the same platform called the Capri. The Capri shared all of the Mustang’s good stuff yet it was more upscale and just like Adrian Monk never got the spotlight. When Ford released the new Fox bodied based Mustang for 1979, the Mercury Capri joined the Mustang on this new platform. Both cars were similarly styled and did share some common parts however the Capri had it’s own unique front and rear styling. It was quite apparent that Ford was marketing the Capri to a more upscale buyer, in the same way the original Cougar was an upscale version of the Mustang. Ford had decided to get back into the muscle car game in 1982 with its first serious performance offering in many years with the return of the 1982 Mustang GT. Ford made sure the Capri would also be a player in 1982 with a RS package which consisted of the Mustang GT’s hot 157 horsepower 5.0 liter (302 CID) 2bbl HO V8 and all the other GT performance package goodies. The Capri RS and Mustang GT had a nice horsepower boast in 1983 with the introduction of the 5.0 liter (302 CID) 4bbl HO V8 rated at 175 horsepower. This may not seem a lot by today’s standards where most V6 motors make over 200 horsepower however back in 1983 most V8s produced around 130-150 horsepower. By 1984 the rivalry between the Mustang GT and Camaro Z28 was as hot as it was during the Mustang/Camaro battles on the SCCA tracks back in the late 1960s. The 1984 Camaro Z28 and Trans Am had a slight power advantage under the hood with the L69 5.0 liter (305 CID) HO V8 that produced 190 horsepower, 15 horsepower more than the Mustang GT and Capri RS. Ford may have fallen behind in 1984 after it took a slight lead over the competition in 1982, 1985 would be the year that it fought back with a vengeance. For 1985 Ford updated the 5.0 liter (302) H.O. 4bbl V8 with a new roller camshaft, forged 8.4:1 pistons, free-flow stainless steel exhaust manifolds, and some other internal engine reworking. There was also a new standard free-flow semi-dual exhaust system. It was a dual muffler system from the cat back with each pipe exiting under the rear bumper (one pipe on the left taillight side and the other on the right taillight side). Gone was the previous single muffler dual outlet exhaust with two pipes exiting on the same side under the rear bumper. The bottom line was a whopping 210 horsepower. This was very big news, after-all the last Mustang 302 V8 to have over 200 horsepower was the 1971 210 horsepower 302 which really made less horsepower than the 1985 5.0 liter 4bbl HO since the 1971 302 was rated in the less stringent gross ratings versus the newer (1972 – current) net figures. In other words what muscle car fans saw with the 1985 5.0 liter 4bbl HO was the hottest 302 V8 since the legendary 1970 Boss 302 (290 gross horsepower). In simple terms this meant the 1985 Mercury Capri RS 5.0 liter 4bbl HO was capable of high 14 second 1/4 mile times and 0-60 mph runs in high 6 second territory. You would think this would have put the Mercury Capri RS on the cover of many magazines back in 1985, but that was not the case. The GT was too busy stealing the limelight leaving none for the Capri. The great news about the 5.0 liter 4bbl HO in the Capri RS, was just like in the Mustang GT it came standard with the Borg-Warner T5 5-speed manual transmission. The T5 was a very smooth transmission that did a great job of getting the 5.0 liter HO’s power to the pavement along with providing a very good overdrive (5th) gear for fuel efficiency on the highway. The downside was if a RS buyer wanted an automatic transmission, a 180 horsepower CFI (Central Fuel Injection) 5.0 liter (302 CID) HO V8 was the only engine available. CFI was a single TBI (Throttle Body Injection) system, for some strange reason Ford never used the term "TBI" in any of their product literature as if it was a dirty word. GM used the opposite approach with the 1985 Camaro Iroc-Z, which had a new 215 horsepower 5.0 liter (305 CID) TPI (Tuned Port Injection) V8 that unfortunately was only available with a 4-speed automatic transmission. The 5-speed (T5) equipped Iroc-Z could only be had with the 190 horsepower L69 (20 horsepower less than the RS and GT’s 5.0 liter 4bbl HO V8). 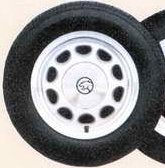 Another advancement for 1985 on the Capri RS and Mustang GT was a new updated suspension with wider tires. One area where the Camaro Z28 and Trans Am beat the 1982-1984 RS/GT was in cornering. The 1982-1984 Z28/Trans Am had wider tires, a lower center of gravity, and better all around suspension design. And the average around .83 skidpad numbers by the performance GM f-bodies (Z28/Trans Am) proved their superiority to the around .75 numbers of the RS/GT. For 1985 the RS and GT were still not getting the numbers of the new 1985 Camaro Iroc-Z and Trans Am however the gap was closing. The TRX tire/suspension package was now history on the RS and GT. The TRX suspension, which was tuned to optimize specialty Michelin TRX tires never really lived up to the hype. The new RS and GT handling package had new stylish 15×7" wheels (still with a four lug pattern), wide and sticky P225/60VR15 BSW tires along with nitro-cushion shocks, and a Quadra-shock rear suspension design. Not only did the RS handle better than the previous year it now had VR speed rated tires. So high speeds on the track could be safely obtained. While just about everything across the board had improved on the Capri RS, there were two major flaws. One as mentioned above was the use of four lug wheels, which were fine on a little economy car but on a performance car it was heresy. The other flaw was mandatory rear drum brakes. With the GM f-bodies, rear drum brakes were standard but rear disc brakes were optional. This is why during the magazine tests of this era the Capri RS and Mustang GT had a difficult time stopping from high speeds while the rear disc brake equipped f-bodies stopped at these higher speeds with ease and in much shorter distances than the RS and GT. However to be fair the RS and GT were generally less expensive than their f-body competitors, so it was more a cost cutting measure to continue to use drum brakes and four lug wheels. Most RS and GT buyers at the time seemed to care little about these two flaws. Now getting back to the Capri RS’s styling. It was actually different, you would expect an upscale Mercury to be more conservative looking than the more pedestrian Mustang GT. However that was not the case. Though the Capri’s front end was not as aerodynamic as the GT it was meaner looking. It had a bold blacked-out front grille on the top with a very large protruding chin spoiler/air dam that looked like something from the "Mad Max" movie car. And as an added bonus inside the center of this spoiler were two stylish driving lights. Now here’s where it gets strange. The RS rear styling consists of a bubble style glass rear hatchback unlike the GT, which had more conservative flat glass. Where the glass bubble meets the end of the hatch near the taillights, there’s a small understated rear spoiler, much smaller than the GT’s. When looking at the whole rear design you can see why Mercury designers made the spoiler so small, it’s size provides a nice balance which a bigger spoiler would ruin by making the car look too much like a "boy racer". 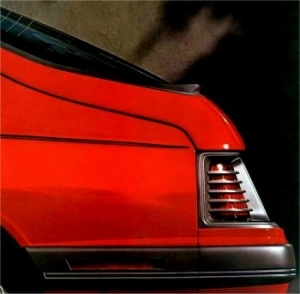 The RS’s rear taillights were futuristic yet still looked as mean as the front-end. In some respect comparing the 1985 Capri RS to a 1985 Mustang GT, the Mustang GT looks like it’s more concerned with aerodynamics than being a mean "strictly business" looking muscle car like the RS. Adding to the RS’s mean look was the fact that it’s trim was entirely painted in black. There was not one piece of chrome on the entire body of the RS with the exception of the "5.0" emblems on the front quarter panels. To sum up the styling, if Mad Max had his choice between a 1985 Mustang GT or a 1985 Capri RS, there is no doubt Max would pick the Capri RS. It certainly is the more macho looking of the two. Where the RS and GT meet is in the interior, the RS has a "carbon copy" 1985 GT interior. Barely anything is different. In fact they are so close that if it was not for the cat head emblem on the steering wheel you may think you’re sitting in a Mustang GT. Overall the RS’s interior is very satisfying, the ergonomic multi-adjustment sport bucket seats are very comfortable with good lumbar support. The instrumentation is simple, but well laid out and very easy to read. The leather wrapped steering wheel breaks no new territory but is appealing to the eyes and easy to grip. What you see in the RS interior broke no new ground in 1985 (in fact it was pretty basic for a performance car) but it looked very sporty with no cheap chrome and it was 100% functional. Overall the interior design and layout has aged well, it all looks as pleasing today as it did 23 years ago. 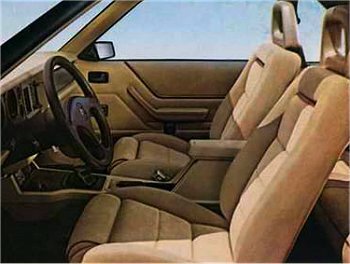 The RS’s interior was not as sophisticated as the GM f-body interiors of the same period but the RS had one advantage the driver sat a little higher in the RS (just like in the GT) and the outward visibility over the hood was fantastic especially with the short hood and more traditional angled front windshield versus the wild futuristic f-body windshield. The RS is also easy to get in and out of. It’s the type of car that you have a blast driving around town slamming through the manual gears yet still be very comfortable in for a long highway trip. The 1985 Mustang GT had an available convertible top option, which unfortunately was not available on the Capri RS. However the RS still managed to offer some open-air fun for the "wind in the face" crowd, with both a T-top and large sunroof option. Beating the 1985 GM F-bodies which only had a T-top option only. 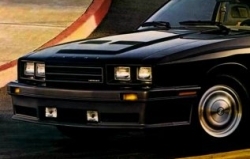 I had an opportunity many years ago to drive a 1985 Mercury Capri RS, it was eye-opening experience due to the fact I was at the time not a big Capri/Mustang fan. At 6’3" tall I felt very comfortable driving the RS. I had a blast running through the T5’s manual gears while the 5.0 liter 4bbl HO V8 made all the right sounds and never seemed to be taxed. When my time behind the wheel of the test drive ended, I was very sad to leave. It was a car I wanted to take home. As great as the 1985 Capri RS was, since it never seemed to catch on with the automotive press or the buying public, lasted only one more year on the Mustang platform before retiring for good (the Capri name returned on another Mercury a few years later to a short lived Miata competitor). However this is not such a bad thing since those that want a very fast reasonably priced rare 1980s muscle car, the 1985 Capri RS is just the ticket. It’s the best of both worlds you have rarity yet also parts availability since many parts are interchangeable with the popular Mustang GT. Not to mention, that as the Capri RS ages eventually the collectors will catch on to their rarity/specialty and "the cat will be out of the bag" and skyrocketing prices will soon follow. They have a potential to be nice future collectibles especially when you consider it was the first year for the roller cam 5.0 liter HO V8 and the last year of the 4bbl carburetor on that motor. The downside is you may be looking for a while before you find one. For 1985 the Capri RS was truly a performer that would please any muscle car fan, it did its job oh so well. Like Mr. Monk it never got the credit it deserved, but then again for the lemmings that never figured out how good this car really was, that’s their loss. So for the Capri RS maybe it’s not such a bad thing being the Adrian Monk of muscle cars.